In an earlier blog, I noted that Dr. Jin Fuey Moy (梅振魁; Mei Zhenkui, 1862-1924) was the owner of a 1908 patent on an enhanced nutcracker for chestnuts (“Attachment for Nutcrackers”, USPN 883,558). Dr Jin was perhaps one of the more colorful Chinese inventors, having been the subject of two US Supreme Court cases involving the regulation of opium sales 241 U.S. 394 (1916) and 254 U.S. 189 (1920). Alert scholar and reader Scott Seligman has pointed out there appears to be one earlier patentee, Ding Cie Sui (Romanized Chen Tzu-sui in diplomatic correspondence), who had a residence in Fuzhou, China and filed three patents in the United States by assignment to two Americans, the Reverends George S Miner and William N. Brewster, of Hing Hua, China (莆仙儂, in Fujian language, or Putian 莆田 in Mandarin). Moroever, his story is perhaps even more colorful to those interested in early Chinese IP history. At some point, the Americans discovered another Chinese – a wealthy, retired government official named Kung I-tu also of Fuzhou – was manufacturing something similar. The licensees lobbied the US mission to ask the Chinese government to stop the infringement. The local government advised that there was no law permitting the transfer of the patent in China and the right was issued only to Chinese natives. An additional argument was made that the accused product relied on water power, while the patent invention relied on foot power, and there could be no infringement. Moreover, the Zongliyamen replied, China had no treaty obligations to protect foreigner’s patent rights at this time. Further detail is set forth in the Papers Related to the Foreign Relations of the United States (1899), beginning at about page 178 under the caption “Protection of Purchasers of Chinese Patents.” These papers include correspondence between Miner and Brewster, the US legation (Mr. Edwin Conger), and none other than John Hay (1838-1905), then serving as Secretary of State under President William McKinley. Hay had begun his government career decades years earlier as private secretary to Abraham Lincoln. During 1899 Hay also negotiated the Open Door Policy (1899), which kept China open to trade with all countries on an equal basis, with international powers. Conger was a civil war veteran who served as Ambassador to China beginning in 1898, through the Boxer Rebellion, returning to the United States in 1901. 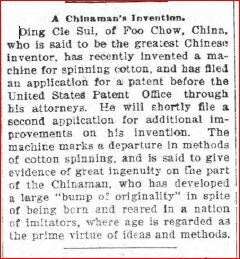 Note: Alert readers may also remember I also described another very early patent litigation in China in the late Qing, which involved two foreign entities in Shanghai pursuant to U.S. law. This case occured before the Guang Xu patent law was even enacted (the“振兴工艺给奖章程”), which (May 1898). 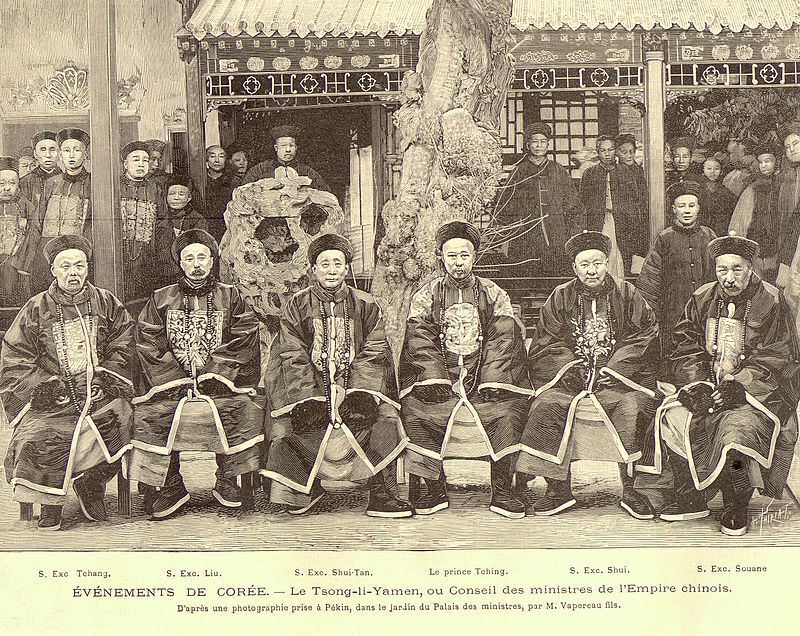 These various cases suggest that there was more patenting and IP activity in the late Qing than has previously been believed. Indeed, some suggest that the earliest effort at a patent law may have occurred during the Taiping rebellion (1850-1864). Several people have reached out to me in the past few weeks about questionnaires that have been sent out by China’s National Development and Reform Commission, which brought the Qualcomm IP abuse cace, to academics, companies and experts regarding IP abuse in preparation for the drafting of the IP Abuse Guidelines. I understand that some of these responses were due at the end of August, while others may be due mid-September. The guidelines themselves are being prepared by the Antimonopoly Enforcement Agencies (NDRC, MofCOM and SAIC), with NDRC as the coordinator and the additional involvement of SIPO. Due to their interagency drafting process, they will be more authoritative than the IP abuse rules issued by SAIC in April which came into effect August 1. There are several “good questions” being asked globally today about such issues as antitrust and standards, patent trolls, F/RAND obligations to license, “smallest saleable patent practicing unit” and the standards setting process. China is certainly an important part of those debates and these questionnaires tend to focus on these concerns and their role in Chinese law. However, I think some equally interesting questions involve issues specific to China’s stage of IP development. How Much Should China Be Focusing on Harmonizing Its AML Regime with International Practices in Light of Its Current IP and Licensing Environment? China has long sought to have a more aggressive global antitrust posture which has been at odds with traditional notions that focused on territoriality of patents and judicial sovereignty in dispute resolution. With the Huawei/InterDigital case, Chinese courts recognized that initiation of a litigation on a standards essential patent in an overseas court (USITC) could constitute a per se abuse of China’s AML law, essentially showing no deference to foreign proceedings or notions of patent territoriality. Moreover, the Court applied Chinese law, nothwithstanding that the relevant agreements were based on French law. China-based global antitrust cases are occurring at a time when our legal systems are increasingly interacting, when Chinese judgments are being enforced in the US, when US courts are struggling with delays in obtaining evidence from China, and when Chinese courts are misunderstanding US decisions involving identical fact situations. Moreover, China persists in aggressive use of pre-AML practices, such as pricing to determine of abuse of dominance, and invalidating of mandatory grant-backs without the benefit of economic analyses. These are practice that are not typically found in jurisdictions such as the United States. Despite these nationalistic views of IP and antitrust, China is also seeking to become a major IP and technology consumer and exporter and will increasingly need a more harmonized environment for its own intangible exports. In short, Chinese regulators may wish to consider how much they wish to continue to create AML and enforcement disciplines that factor into global best practices. How Much Should A Patent’s Pro-Innovation Effects Outweigh Alleged Anticompetitive Effects? Chinese officials, like officials in many companies are asking about right “balance” between IP protection and antitrust enforcement. The questions often assume that some of those balances have not already been established and that new doctrines need to be created. In the United States our constitution clearly establishes that patents were established for a pro-competitive purpose, namely to “promote the progress of the … useful arts.” The basic notion is simple: this pro-competition process requires a disclosure of information that might otherwise be maintained as confidential, in order to secure a limited right to exclude others from practicing the invention. Overly aggressive antitrust enforcement can result in a diminution of incentives to disclose and affect global innovation ecosystems. In short, patent and antitrust doctrines are not necessarily in conflict, and, in fact, help foster competition together. The starting point of that discussion however is the incentive afforded by the patent system to disclose technology in order to exclude others and ultimately contribute to the public domain of technology when the patent lapses. As the world’s largest high tech exporter of goods that China in large part did not invent and the country with the largest patent system, China has benefitted enormously from the stability afforded by that patent system. Rather than seek to minimize IP rights through euphemisms such as “balance” perhaps a better approach would be how to optimize the patent system to foster long term innovation and competition and insure that the competition system supports and does not retard such development. Is There Sufficient “Use” of IP Rights in China to Justify Aggressive Enforcement Against IP Abuse? Available data suggests that China is a remarkably under-licensed economy – accounting for a lion’s share of high tech production and exports with a limited share of licensing revenue. China is also a major “exporter” of IP litigation, with many companies reluctant to bring suits in China against Chinese infringers but preferring to bring suits which they believe will afford a more effective process, such as the United States or Germany. The Chinese government has complained that patents, in particular, are difficult to enforce, due to challenges such as damages being far too low, litigation too time consuming, difficulties in satisfying burdens of proof, etc. The challenges to foreign licensors are especially acute. As one commentator noted: ” anti-trust compliance is just one challenge faced by licensors in China; other challenges relate to restrictions on technology imports, under-reporting of royalties, difficulties with audits, dispute resolution and more.” A related questions to this issue is What circumstances exist to suggest that a prospective licensee is engaged in patent hold-out, i.e., refusing to license in good faith which might suspend the licensor’s F/RAND obligation, or when a prospective licensee is using the licensing negotiations to precipitate a Chinese antitrust case – circumstances which the court appears to be facing in the Vringo/ZTE case. How Much Should China’s AML Practices in IP be Governed by the TRIPS Agreement? I personally believe that a too-often ignored discipline on AML practices involving IP remains the TRIPS Agreement. Articles 7, 8 and 40 of the TRIPS Agreement discuss abusive licensing practices. If an AML investigation involves IP licensing practices, the national treatment and most favored nation treatment obligations of TRIPS should also apply. I believe the enforcement provisions of the TRIPS Agreement also establish certain minimal due process standards, which are further enhanced by China’s commitments at WTO accession. For example, WTO members bringing IP abuse cases are likely obligated under TRIPS to provide “fair and equitable proceedings” (Art. 41), written and reasoned decisions (Art. 41), decisions based on evidence (Art. 41), judicial review (Art. 41), the right to written notice (Art. 42), the right to independent legal counsel (Art. 42), the obligation to substantiate claims (Art. 42), the means to protect confidential information (Art. 42), and approximate conformity of administrative procedures to civil procedures (Art. 49), amongst others. How Much Should China Rely on Economic Analysis in Making AML Decisions and/or Explicitly Reject Industrial Planning? China desperately needs more qualified economists in assisting with policy decisions and actual disputes in both AML and IP matters. China’s metrics-driven approach to IP and innovation based on criteria such as numbers of domestic service invention patents in key areas, licensing revenue and costs, numbers of global famous brands, plans to develop China’s own products in IP-intensive sectors, Chinese participation in global standards setting bodies, and the subsidies that are often provided for these efforts – place additional burdens on regulators as antitrust policies could be bent in the direction of state industrial goals to increase licensing revenue, decrease licensing expenses, provide import substitutions, develop local champions, etc. A hopeful sign in this area would be the additional employment of economic experts by both the enforcement agencies and the courts. How Much Should China Be Concerned About NPE’s or How Much Should China Be Concerned About Patent Quality? China’s research entities generally play a more active role in China’s patent environment than in the US. An undue emphasis on “non-practicing entities” as a source of “IP abuse” or litigation abuse could weaken the role of this important sector of the Chinese (and global) research environment. Rather than asking if non-practicing entities are a source of IP abuse, a “better question” might be “should the nature of the patent owner have any bearing of whether the owner is engaged in abusive conduct.” In general, I side with former Chief Judge Rader’s perspective on this issue: the question is not one of the nature of the owner, but the quality of the right. High quality patents should be enforced, no matter the nature of the owner of the right. This question is especially important to China due the higher incidence of research institution and non-service invention patenting. Moreover, the relatively high damage awards and rate of injunctive relief for unexamined utility model and design patents, suggests that there may continue to be problems with assertions of low quality patents in China. I hope that NDRC and its sister agencies publish their surveys and the results of the surveys for the public to better understand the nature of the debate and questions being asked. This is a laudable task and I hope the right questions, in addition to the right answers, are being given to Chinese agencies. These are my personal observations. Please feel free to supplement or correct with information that you have, and feel free to share your thoughts and opinions. Courtesy Brookhaven National Laboratory. 1980 Laureates Val L. Fitch and James W. Cronin, and 1976 Laureate Samuel C.C. Ting. 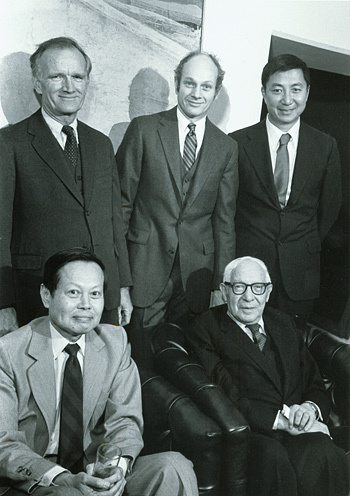 Sitting (left to right): 1957 Laureate Chen Ning Yang and 1944 Laureate Isidor Isaac Rabi.